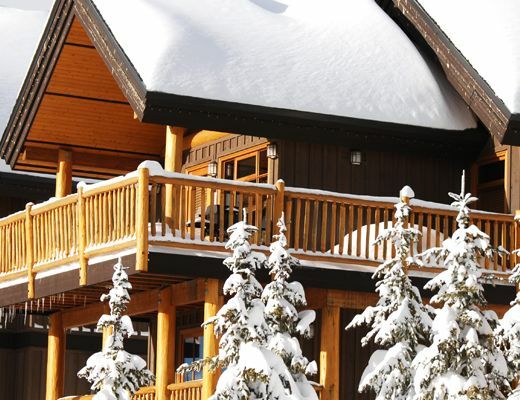 This romantic rustic-inspired chalet offers guests the idyllic Big White Resort vacation without sacrificing any element of style. Modern amenities are brilliantly mixed with alpine accents to create a stunning backdrop, perfect for your upcoming ski getaway. Charming and understated, this Bullet Creek Cabin offers comfortable lodging while surrounding you in natural beauty. Hand-peeled posts and beams are beautifully accented by the impressive river-rock fireplace, providing a warm and welcoming atmosphere throughout. Spacious and bright, this lovely four bedroom + den rental is host to relaxed furnishings, a neutral color palette and pleasing textiles. The kitchen offers contemporary appliances, granite countertops, handsome shaker-style cabinetry and a breakfast bar for additional dining. Each bedroom is well-appointed and promises a peaceful slumber, while the three bathrooms offer modern fixtures including a soaker tub and walk-in shower. With equipment storage and a private outdoor hot tub also available for your use, this Bullet Creek cabin to please.